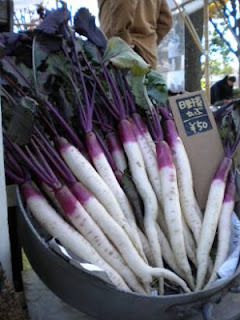 Japan Farmers Markets: Oxfam Presentation and Earth Day Market Tour this Weekend! Oxfam Presentation and Earth Day Market Tour this Weekend! Heirloom kabu at the Earth Day Market! Just a quick reminder that this weekend I'll be giving a talk about farmers markets and why they're such a great idea for farmers as well as those who like to eat. The Saturday workshop will be informative, fun, and interactive, and the Sunday visit to the Earth Day Market will be all of that and more. Note: The Oxfam International Volunteer Group events page is suffering some technical difficulties at the moment. If you're interested in coming, please leave a comment here with your email and I'll get you registered. Meet on the bridge to Meiji Shrine near Harajuku Station. I'll be the tall woman with glasses and a red umbrella.